What now appears as a very plain-Jane brick two-storey building was once a striking four-storey hotel. The main floor storefront had high stained glass clerestory windows that blended well with the adjacent (1280 Douglas Street) styling. Built in 1893, it featured high-ceiling upper storey levels, arched fanlights, intricate brick detailing, and a prominent upper parapet and cornice. The original owner, J Keith Wilson also operated a popular saloon at this location. He purchased the land from Miss Margaret Doane in 1891; the building permit was dated January 3, 1893 and noted “Central Ward – J. K. Wilson, Yates Street; 3 4-storey brick stores – $17,000.” The hotel was also the home of Bancroft’s Candy Factory. By 1907, the building had been sold to Louisa E Gordon who renamed it the Gordon Hotel. It was also the site of one of Diego Zarelli’s many cigar store and shoe shine businesses, Mrs. Ethel J. Tripp – millinery, A. B. Oldershaw – watchmaker, and the Wilson Bar. At some point, the top two floors were removed, taking along with them the intricate parapets and the distinctive name plate. All that remains of the original design is the articulated vertical piers. The facade has been stuccoed and the storefronts altered beyond recognition. However, this building is still important as it is part of the historic streetscape of this side of Yates Street; most of the other buildings remain much as they were constructed. 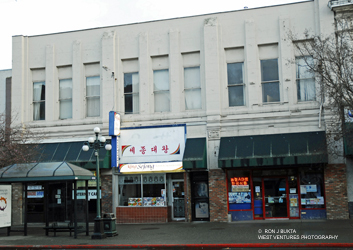 In 2009, the building houses a Korean grocery store, an internet cafe and a Korean and Japanese food restaurant.